International Trade Trends – Ford Cancels Mexico Manufacturing Plant. 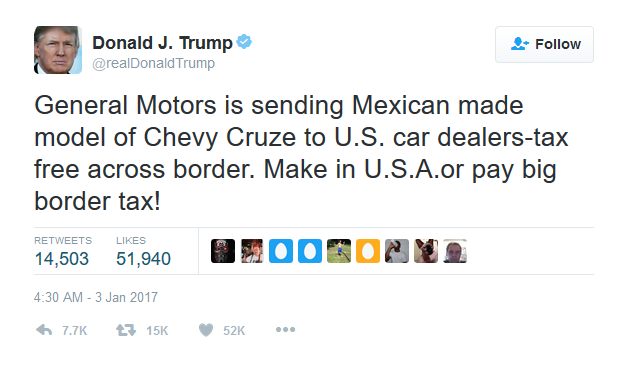 International Trade Trends – Ford Cancels Mexico Manufacturing Plant Is Trump’s Bite As Big As His Bark Or Is He Just A Good Negotiator? Is Trump’s Bite As Big As His Bark Or Is He Just A Good Negotiator? There is a clear message that is getting around to all the major corporations across the Nation. That is “Prepare to come back or stop what you’re doing if you’re thinking of outsourcing”. Is it clear that the new President-Elect is determined to show progress before his term even begins. Most major political leaders around the world have already started focusing on negotiations with the President-Elect than the current administration. The tides are shifting in the political arena and they are shifting very fast. Many that oppose his actions call it crony capitalism. Maybe they are right and maybe they are wrong. That is really a matter of opinion based on which side you’re standing on. That is not the point of this topic. We’ll leave it for an article for another day. This article focuses on the impact these events will make in America and how you can benefit from it. Ford Motors Cancels Mexican Plant - Ford's Announcement. Shortly after President-Elect’s tweet, Ford Motor CEO Mark Fields, holds a special news conference announcing that they are canceling their plans to relocate their manufacturing plant to Mexico. It is unprecedented in political history that such an action would be taken by a major corporation hours after a simple tweet. It shows the amount of pressure someone with clout can put on an establishment in seconds with mere characters. The proposed manufacturing plant in Mexico was going to take $1.6 billion to build and would have been located in San Luis Potosí and would produce smaller vehicles like the Ford Focus. Instead, The company will focus on increasing production in their Flat Rock, Michigan facility for the hybrid vehicles and trucks. Shortly after Ford CEO’s announcement, the stock rose by over 3%. Almost as if the economy and investors rewarded them for the decision made. The impact of this investment to the Flat Rock, community is tremendous. In a day in age where manufacturing jobs were leaving by the thousands. This move is expected to increase the potential job pool by 700 new positions. In a small location like a city compared to a state, the impact is great. It will allow families to work, to provide and to prosper. If you’re looking to increase your company’s potential in a year where investments are set to flourish. Contact us at Meridian PO Finance 866-988-6868 for quick and easy pre-approvals.